Returning champion JW WHo Dat will will to pick up his second consecutive $25,000 Magnolia Stakes on Saturday at Louisiana Downs. BOSSIER CITY, LA—JANUARY 29, 2019—A busy week is shaping up at Harrah's Louisiana Downs, beginning on Friday (Feb. 1) with 14 Mardi Gras schooling races scheduled, beginning at 11:00 am and live cards set for Saturday, Sunday, Monday and Tuesday. This week's stakes features a field of eight accredited Louisiana-breds competing at the distance of 870 yards in the $25,000 Magnolia Stakes on Saturday (Feb. 2). Defending champion Jw Who Dat has been installed as the morning line choice at odds of 2-1 and will be ridden by his regular pilot, Antonio Alberto. The 7-year-old son of Agouti out of the Heza Fast Man mare Ew Comment was bred in Louisiana by J W Owens. Now owned by Giovanni Barron and trained by Eric Palacios, he had never run an 870-yard race, or competed at the stakes level until last January. He quickly proved his excellence around the hook winning both the $15,000 Marathon Stakes and following that up with a victory in the 2018 Magnolia Stakes. He added stakes wins at Delta Downs and Fair Grounds last year before running eighth in the Herman Jefferson Stakes at Zia Park in Hobbs, New Mexico. 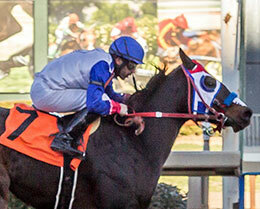 However, Jw Who Dat returned to form on December 15 with a solid allowance score at Evangeline Downs. Jw Who Dat ran third in the Marathon Stakes here on January 12, but Alberto was not overly disappointed based on his challenging schedule in 2018. "He needed the race and the win at Evangeline took a lot out of him," explained Alberto. "I'm hoping for a decent pace this Saturday so he'll have plenty of gas for the finish. He's a pretty cool horse and one of my favorites, for sure." Jw Who Dat enters Saturday's feature with a record of nine wins from 32 starts and earnings of $127,542. Other contenders include Rakin in the Jax, who rallied late for a second-place finish in the Marathon Stakes. Owned by Angela Dowden and trained by Jason Magnon, the 7-year-old son of Rakin in the Cash has won seven distance races in his career, and will make his third start in the Magnolia Stakes. Jockey Luciano Duenez has the return call and will guide his mount from the rail post in Saturday's feature. Im Mighty Fast, owned by Triple M Racing Stables, LLC, was the runner-up in last year's edition of the race. The 6-year-old sired by Mighty Corona exits a third-place finish in the races and Aces Stakes last November at Evangeline Downs. He sports a solid 660-yard drill on January 24 and will be ridden by Jose Rodriguez. Both Mr Desert Streak and Zoomins Jewel, competed in this year's Marathon Stakes. Kaylee Walker's Mr Desert Streak, ran fourth for trainer Trey Ellis and will be ridden by Donell Blake. Zoomins Jewel, trained by former rider Ray Mayo for owner Dudley G. Chewning, finished fifth in the January 12 feature. His regular pilot, Donald Watson, has the call. The Magnolia Stakes will run as the sixth race of the card, with an approximate post time of 3:00 pm (CST). Through January 29, Manuel H. Macias tops his fellow conditioners with 10 wins. Willie Simien, Jr. is second with eight victories with top Louisiana trainer Kenny Roberts saddling seven winners this meet. Lanny Keith rounds out the top four with six wins. Everardo Rodriguez is well on his way in defending his 2018 leading rider title. Through the first three weeks of the meet, Rodriguez has won 18 races, with his mounts finishing in the top three at an impressive 69% statistic. John Hamilton is second in the standings with nine wins, followed by Rolando Cabrera with eight victories. Donald Watson and Luciano Duenez are tied for fourth with six wins each. Jose O. Barron tops the leaderboard in the owner standings with seven wins from 14 starters since the 2019 Louisiana Downs Quarter Horse meet began on January 5. Gladney 1 LLC is second with a perfect three for three and ten owners are tied with two wins each. Harrah’s Louisiana Downs is hosting an exciting on-track handicapping contest called the Road to Kentucky Handicapping Contest. It began on Saturday, January 19 with major stakes races and Kentucky Derby prep races featured each Saturday through May 4. Fans can register at the contest table adjacent to the program stand with weekly prizes awarded and points accumulated toward the $1,000 grand prize. For more information, For more information, CLICK HERE. The 2019 Quarter Horse racing season at Harrah’s Louisiana Downs got underway on Saturday, January 5. The 46-day meet includes 12 stakes highlighted by the first official championship for 2-year-olds, the $100,000-added Mardi Gras Futurity on March 16. Live racing will take place Saturday, Sunday, Monday and Tuesday with a 1:00 p.m. (Central) post time and will continue through March 20. To see a complete list of the stakes schedule, including trial dates CLICK HERE.